Ready to De-Clutter for Better Indoor Air Quality? Here�s What to Do! For many of us, the concept of “spring cleaning” relates directly to spraying and scrubbing and dusting and vacuuming until our space looks spotless. In more recent years, however, health research has revealed that we may actually be making our indoor air quality worse by doing this type of vigorous home or workplace cleansing! As well, often spring cleaning addresses only visible areas of high traffic—the very areas that are likely to need more cleaning again in the near future. What about those over-full closets, dusty attics, dim-lit garages and musty coat closets? We often think these areas can wait. But these are the same areas that can make a just-cleaned house still smell dank and mouldy. There are a few different issues at work here: the types of cleaning supplies you use, where you clean and whether you take the time to de-clutter periodically. In this article, we address each one in turn to show you quick and easy ways to clean up your indoor air along with your home or office. According to Environmental Defence Canada (EDC), we spend nearly $650 million dollars on household cleaning products each year. This adds up to around $250 per household just for cleaning supplies. Clearly, we are not a nation that shies away from cleaning chores. But are these efforts doing us more harm than good? According to EDC, the answer depends on what kind of cleaning supplies we are purchasing. To evaluate different cleaning products and their air quality impact, the EDC conducted a study of 14 homes. The measurement used was volatile organic compounds (VOCs). Participating homeowners who cleaned with conventional (non-eco-friendly or “green”) cleaners had 120 percent more VOC-based air pollution after cleaning than before they started. Participating homeowners who cleaned using eco-friendly or green products had an average increase of about 35 percent air pollution. Participating homeowners who cleaned using “green” products (products that claimed to be eco-friendly but did not list out their ingredients to support their claims) showed an increase of 100 percent VOCs. Clearly, even commercial eco-friendly cleaning products can have a negative impact on the quality of your indoor air. What can you do about this? You have to clean, right? The EDC recommends using simple homemade cleaners that have no hidden chemical ingredients (or ingredients with such complex names you have to look up them on the internet). You can take a look at our blog post “The Best Natural Home Cleaners to Maintain Good Air Quality” to learn easy, cheap and effective recipes for household cleaning products and air fresheners that will not toxify your indoor air. If you had to take a guess, what room in your home do you think is the most toxic in terms of air quality? According to a recent program featured on CTV News Canada, that room might well be the garage. The reason is simple: that is where your car emits exhaust and all of the airborne VOCs that go with it—and especially a compound called benzene. Even after you turn off your vehicle, it will continue to emit these VOCs as it sits there. If your home has an attached garage, your risks of these VOCs entering your home air supply and toxifying it rise threefold. But your vehicle is not the only reason your garage tends to be the most toxic room. 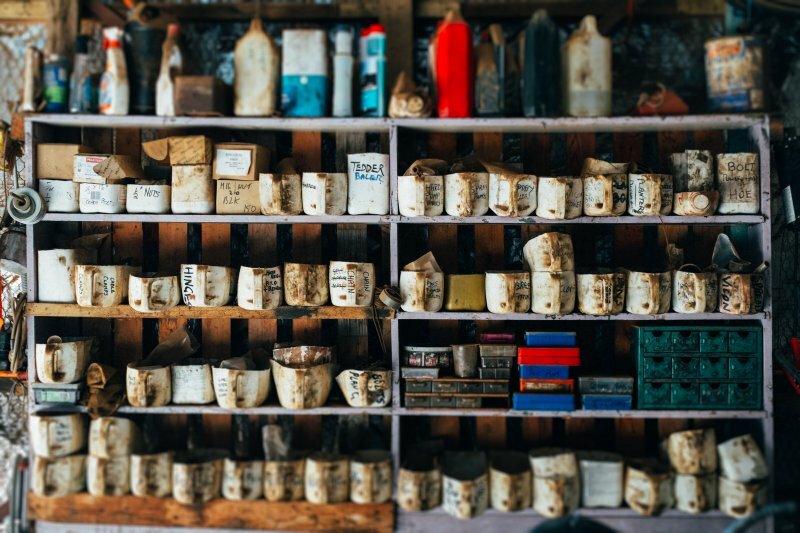 The garage is also one of the most common places where people store home renovation, repair, craft and other DIY supplies. Many of these supplies, including adhesives, solvents, primers, paints, insulation and other hazards are highly toxic in their own right and can release more VOCs into your air when used. Not only does this make cleaning out your garage and any relevant workshop spaces a priority, but it also means you need to wear appropriate eye and respiratory protection when you clean. By removing unused, outdated or empty cans and packages and disposing of them safely, you reduce the chances of additional passive VOC emissions entering the air inside your garage and your home. You also have the chance to inspect the floors, walls and ceiling around where these items used to sit to be sure you don’t have mildew and mould colonies, flammable debris, water leaks, rust and other dangers lurking. Other key areas where your cleaning attention is needed include utility closets, seasonal coat and shoe closets, cleaning supplies cabinets and closets, attics and any other rarely used space where less-needed items are tucked away and forgotten about. As you are cleaning these potentially dangerous yet less-remembered areas of your home or office space, this is also the optimal time to de-clutter for easier inspection and cleaning in the future. We acknowledge this can be particularly tough to do if you are more of a “collector,” but the benefit to your overall health is significant enough that it’s worth making the effort. Every stored item will in time collect a layer of dust. Some will begin to leak or degrade. Others will simply expire, rendering them useless anyway. Semi-perishables such as seasonal clothing and sports gear can start to grow mildew or mould, causing them to become unsafe to wear or use. While it sure is tempting to keep the things into which you have previously invested your time and finances, once these things have been impacted by time, wear and tear, seasonal humidity and/or ingredients breakdown, they are really no longer safe or healthy for you anyway. Right now, you can save 10 percent on all three of our indoor air duct cleaning packages—just in time for your spring cleaning needs!